The Commonwealth War Graves Commission (CWGC) Le Touret Memorial to the Missing is located in the cemetery of the same name near Richebourg, Pas-de-Calais, France. The memorial is a loggia surrounding an open rectangular court that dominates the eastern side of the site. 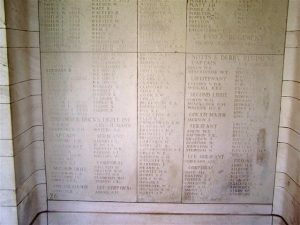 The names of those commemorated are listed on panels set into the walls of the court and the gallery, arranged by regiment, rank and alphabetically by surname within the rank. The memorial was dedicated in 1930 and was designed by John Reginald Truelove (1886 – 1942), a protégé of Sir Edwin Lutyens, who had served as an officer with the 1st Battalion 24th County of London Regiment (The Queen’s). 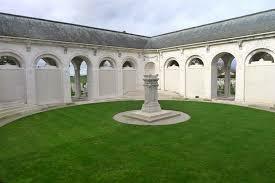 He also created the Vis-en-Artois Memorial to the Missing for the CWGC. To the Glory of God and in Memory of 13,482 British officers and men who fell fighting in this neighbourhood from October 1914 to September 1915 whose names are here recorded but to whom the fortune of war denied the known and honoured burial given to their comrades in death. 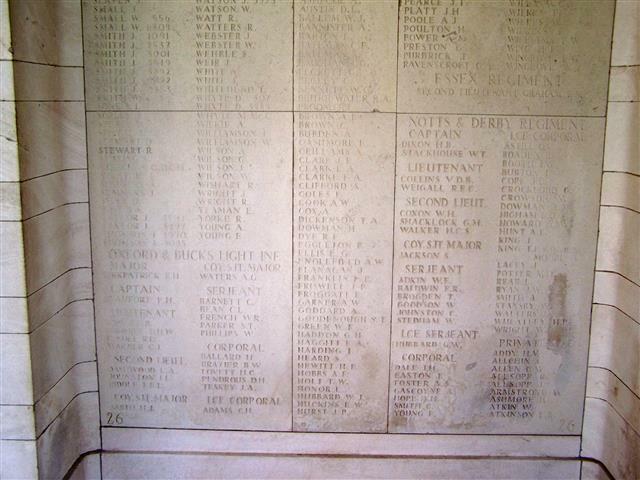 Indian Army missing are commemorated on the Neuve Chapelle Memorial and the Canadians on the Vimy Ridge Memorial. The Le Touret cemetery has 912 individual burials original to the period, and it formerly had 264 Portuguese burials until these were relocated by their government. This list represents the latter part of the tenure of Field Marshal Sir John French (1852-1925) as the Commander of the British Expeditionary Force (BEF). French was born into an impoverished branch of a family of the Irish Peerage. 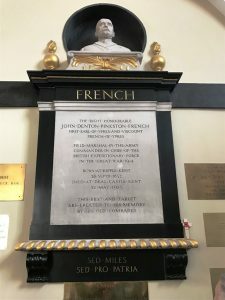 His father was a navy officer of sufficient rank that young John was accepted as a midshipman, but after four years of training before the mast, he was released due to chronic sea sickness. He spent four years trying to earn an artillery commission by examination but ultimately had to purchase a commission in the 8th Kings Own Royal Irish Hussars, a prestigious cavalry regiment founded in 1693. Given two months to pay, even after the sale of family property he couldn’t raise the agreed price, not the only time in his career that he found himself flirting with disgrace. He was spared by the substitution of a commission in a new regiment, the 19th Hussars, which cost he could afford. In 1881 he was delisted from the 19th for undisclosed reasons but it was rumored that he had an affair with his commanding officer’s wife. French was banished to the Northumberland Hussars, a Yeomanry formation. Re-instated in 1884 he rejoined the 19th in the Sudan, where he impressed Gen. Sir Henry Redvers-Buller (1839-1908) and was soon promoted. By 1888 he was commanding the 19th. He was restored in 1895 through the intervention of Redvers Buller, and assigned to write a new cavalry training manual, with the assistance of Haig. French fell into financial default in 1899 and only a loan of £2,500 from the whiskey fortune heir Haig kept him from insolvency and yet more disgrace. Historians disagree as to whether this debt was repaid. At the start of the South African War (1899-1902) French took the 2nd Cavalry brigade to the Cape. He soon was commanding a division, led the relief of Kimberley and endeared himself to Field Marshal Lord Roberts (1832-1914) as a go-to leader. French remained in South Africa until 1902 and returned as a Lt. General. He was the Chief of the Imperial General Staff from 1912 to 1914, receiving his Field Marshal’s baton in the 1913 honours. 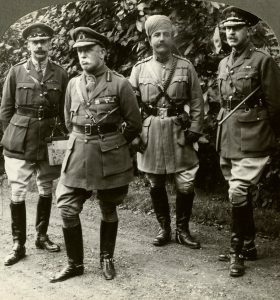 He was selected to command the BEF on July 30th, 1914, and he named Haig the major general commanding the BEF’s 1st Division. French regularly quarreled with his French army counterparts, and requests were made that he be replaced. Once again, there were reports of his dalliances with women, even a diplomat’s wife. The Loos Offensive (Sept. 25th – Oct. 8th, 1915) was French’s undoing. This unsuccessful attack foreshadowed the whole Somme experience; mines and gas were used ineffectively, artillery barrages failed to reduce enemy defenses or even cut barbed wire, and the BEF lost nearly 60,000 men, considered appalling at the time. The politicians blamed French for failing to commit his reserves (the source of this theory was Haig); French blamed the politicians for the shortage of artillery shells and hand grenades. It is also thought that French may have experienced a ‘nervous breakdown’ or a ‘crisis of confidence’. After a month of arguing and dithering, in early December French was required to step aside in favor of Haig. French was made the commander of the Home Forces, hierarchically the same as commander of the BEF. In this job he was placed squarely in the middle of the 1916 Irish ‘Troubles’, becoming the military governor of Ireland from 1918 to 1922. In the honours list of 1922 he was created the Earl of Ypres, a peerage now extinct. 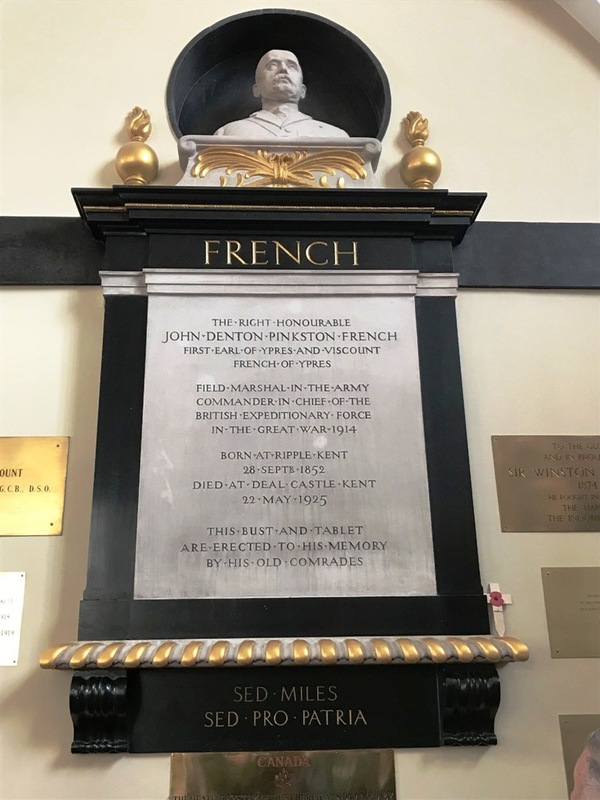 Post-war, French remained popular, as evidenced by the magnificent memorial plaque to him in the St. George’s Church, Ypres, the largest in the sanctuary. 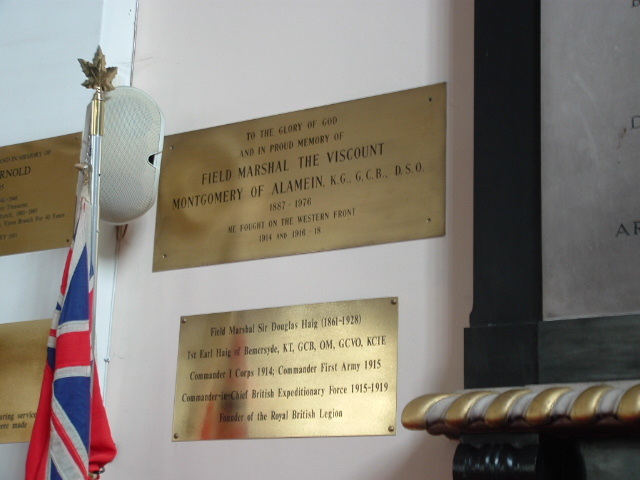 Flanking the French memorial are much smaller plain brass plates honoring Bernard Montgomery of WW2 fame, who was a junior officer in WW1, Winston Churchill and the smallest one is for Douglas Haig.